Once, 78 Clinton Street was an icy battleground. few years after I moved into the building at 78 Clinton Street on Manhattan’s Lower East Side, the landlord decided he wanted to sell it. But there was a hitch in his plan. Annoyingly, because of low-rent tenants protected by rent stabilization laws, no one wanted to buy the place —unless he managed to get rid of all the occupants first. Though there was no organized resistance, many tenants refused to move. Soon after, and not so mysteriously, fires were set in vacant apartments. Heat and hot water were cut off for weeks at a time. The pipes froze. The lights in the hallway were mostly off. Many in the building took the hint. After less than a year, they moved to a less problematic slum. But I’d be damned if I was going to let that landlord, or the one that followed, or the one after that, prevail. I stuck it out. In a nearly vacant building, I crept trembling up the stairs in the dark. I hauled water in pots and buckets up from the restaurant on the corner, where a cook took pity and let me fill at the kitchen tap. I took my baths in a green plastic washtub. I stayed awake nights for fear of fire. In the end, only two tenants remained — me and a man named Maxim Andreevich. Many in the building took the hint. After less than a year, they moved to a less problematic slum. But I wouldn’t move. Max was an indomitable old Ukrainian who was paralyzed on one side of his body. He walked with a cane, dragging his dead leg along. He somehow managed to take care of himself without help from anyone. He was utterly alone. If I was in the least tempted to flatter my sense of endurance, there was Max with his thousand-yard stare and a set to his jaw that bulldogs must have copied from Ukrainian peasants like Max. “You? Tough?” Max didn’t even have to say it aloud, let alone spit for emphasis. For Max, what I might have considered virtuous hardship was just life. He climbed the same stairs, carried the same water, and bore the same cold. He did everything I did, except as a vulnerable old man with only one arm and one leg. Over the three years Max and I resisted and defeated the attempts to move us out, he seemed to come around to the conclusion that I might not be completely useless. I did what I could for him without encroaching too much on his treasured independence. In his clean orderly kitchen, I cut the fingernails of his right hand for him. Occasionally, I took his grocery list to the bodega and brought back eggs, bread, and cabbage. One day he gave me an envelope, and asked me to write on it an address: Mikhail Andreevich, Connecticut. “My brother,” he said. He did not mention the brother again. Later, he instructed me to make a sign on a piece of cardboard and attach it to the wall above his kitchen table. He dictated: “When I die, I want be cremate.” Verbatim. I held the cardboard down while he laboriously signed it in a scrawl at the bottom. 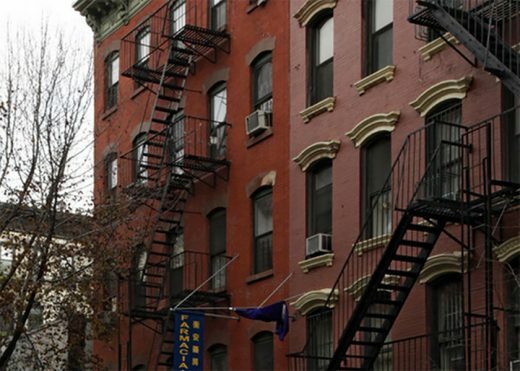 In the end, the City of New York seized the building at 78 Clinton Street for unpaid taxes. At about the same time, the super in a neighboring building told me of an available apartment just down the block, which would cost more —$85 a month —but had a real bathroom. And heat! That sold me, and because the City had taken over the building, I felt I could move without any sense of betraying Max. But because the City was now the landlord, it was inevitable that Social Services would get wind of this 80-something-year-old living in an abandoned structure riddled with building violations. So, they removed Max against his will to a senior housing project near the East River. Arson was commonplace in New York of the 1970s, particularly in the South Bronx, some set by landlords to free up rent-controlled apartments, others by tenants to qualify for better housing. The last time I saw Max, it was in his modern new apartment. In these bright rectilinear surroundings, he looked smaller and more misshapen than he had in the small apartment on Clinton Street. The floor was covered with sanitary vinyl tiles. The walls were a cheery pastel pink. The light was a sensible fluorescent. The vinegary odor of his old apartment had not moved with him. He glowered at me from his new kitchen table like an irritable toad in a Delft teapot. He nodded his head absently, and muttered “Tak, tak” — “Yeah, yeah” — a few times. I thought he was going to refuse to talk to me. “They bring me here, this place. I don’t want, but no choice. “They take me doctor. Doctor is crook. “They bring grocer. Is not my grocer. Max pointed to a new solid state clock radio sitting on the table next to him. “It make me crazy!” He waggled his heavy eyebrows for emphasis. “I turn on. It turn off. I go to sleep. It turn on. I want radio, it go BZZZZZZZZZ until I pull plug. He sat nodding his head again for a moment. Then a look of cold triumph spread over his ancient face. Joe Scott was born Joseph Scott Fuller in 1947. He has played the roles of "red-diaper baby," quitter of college, radical leftist, icer on a salmon cannery slime line, tire warehouseman, carpenter in the World Trade Center towers, printing press operator, computer programmer, and husband and father — all to predominantly excoriating reviews. He now lives in Oakland, California with his partner of 14 years.